Cricothyroidotomy is usually regarded as an emergency surgical procedure in which a surgeon or other trained person cuts a hole through a membrane in the patient's neck into the windpipe in order to allow air into the lungs. Cricothyroidotomy is a subtype of surgical procedure known as a tracheotomy ; in some situations, it is considered an elective alternative to other types of tracheotomy. The primary purpose of a cricothyroidotomy is to provide an emergency breathing passage for a patient whose airway is closed by traumatic injury to the neck; by burn inhalation injuries; by closing of the airway due to an allergic reaction to bee or wasp stings; or by unconsciousness. It may also be performed in some seriously ill patients with structural abnormalities in the neck. Some surgeons consider a cricothyroidotomy to be preferable to a standard tracheotomy in treating patients in an intensive care unit . The demographics of cricothyroidotomies are difficult to establish because the procedure is relatively uncommon in the general population, even in emergency situations. In the emergency room, the incidence varied between 1.7% and 2.7%. A study found that nine of a group of 1,560 patients admitted for blunt or penetrating injuries of the neck required emergency cricothyroidotomies, or about 0.5%. Another study found that the most important single cause of injuries requiring emergency cricothyroidotomy was traffic accidents (51%), followed by gunshot and knife wounds (29%); falls (5%); and criminal assault (5%). Most cricothyroidotomies are performed on adolescent and young adult males, because this group accounts for the majority of cases of neck trauma in the United States. It is estimated that injuries to the neck account for 5–10% of all serious traumatic injuries. There are two basic types of cricothyroidotomy: needle cricothyroidotomy and surgical cricothyroidotomy. In a needle cricothyroidotomy, a syringe with a needle attached is used to make a puncture hole through the cricothyroid membrane that overlies the trachea. After the needle has reached the trachea, a catheter is passed over the needle into the windpipe and attached to a bag-valve device. In a surgical cricothyroidotomy, the doctor or other emergency worker makes an incision through the cricothyroid membrane into the trachea in order to insert a piece of tubing for ventilating the patient. The primary concerns in emergency medical treatment are sometimes known as the ABCs: Airway patency (openness), Breathing, and Circulation. Keeping the airway patent is critical to an injured person's survival. The signs of a blocked airway in people are obvious, including a bluish complexion (cyanosis); noisy breathing, unusual breath sounds, or choking; emotional agitation or panic; and often loss of consciousness. Major injuries to the face or jaw, such as multiple fractures of the jawbone or severe fractures of the patient's midface. In many cases of facial injury, the airway is blocked by broken teeth or fragments of bone from the jaw and cheekbones. Burns in or around the mouth. A neurological disorder or damage that has caused the patient's teeth to clamp shut. Fractured larynx. Fractures of the larynx most commonly result from automobile or motorcycle accidents, but also occur in cases of strangulation or attempted suicide by hanging. Larynx swollen shut by allergic reaction to bee or wasp venom. The first steps in preparation are the same for needle and surgical cricothyroidotomies. The patient is positioned lying on the back with a towel under the shoulders and the neck stretched backward (hyperextended). If the patient is conscious, he or she is given a local anesthetic. The doctor then palpates, or feels, the patient's throat for the thyroid cartilage, or Adam's apple. This piece of cartilage is an anatomical landmark for this procedure, which means that it is a structure that is relatively easy to identify and serves as a reference point for other structures. In men, the Adam's apple is easy to find by running the finger down the center of the neck. In women, however, the thyroid cartilage is less prominent. Below the thyroid cartilage is a softer area about the width of a finger; this is the cricothyroid membrane, which is a piece of tissue lying between the thyroid cartilage above it and the cricoid cartilage below it. When the doctor has located the cricothyroid membrane, he or she will scrub the skin over it with a povidone-iodine solution to prevent infection. In a needle cricothyroidotomy, the doctor uses a 12- or 14-gauge catheter and needle assembly. The needle is advanced through the cricothyroid cartilage at a 45-degree angle until the trachea is reached. When the doctor is able to withdraw air through the syringe, he or she knows that the catheter is in the correct spot. The catheter is then pushed forward over the needle, which is then removed. An endotracheal tube connector is then fitted onto the end of the catheter and connected to a bag-valve unit with an oxygen reservoir. A needle cricothyroidotomy will supply the patient with enough oxygen for about 40–45 minutes; it is a time-limited technique because it does not allow the efficient escape of carbon dioxide from the bloodstream. It will, however, help to ventilate the patient until he or she can be taken to a hospital or trauma center. Needle cricothyroidotomy is the only form of this procedure that can be done in children under 12 years of age. The reason for this restriction is that the upper part of the trachea is not fully developed in children, and a surgical incision through the cricothyroid membrane increases the risk of the child's developing subglottic stenosis, which is a condition in which the trachea is abnormally narrow below the level of the vocal cords due to an overgrowth of soft tissue. It is often seen in children who were intubated as infants. In a surgical cricothyroidotomy, the doctor steadies the patient's thyroid cartilage with one hand and makes a horizontal (transverse) incision across the cricothyroid membrane. The incision is deepened until the airway is reached. The doctor then rotates the edge of the scalpel 90° in order to open the incision to receive an endotracheal or tracheotomy tube. A hemostat or surgical clamp may be used to hold the incision open while the doctor prepares to insert the tube through the opening into the trachea. After checking the tube to make certain that it is in the proper location, the doctor tapes it in place. If necessary, the doctor may use suction to clear the patient's airway. In some emergency situations, the doctor or other medical professional may not have an antiseptic available to cleanse the skin over the patient's throat, and may have to use any sharp-edged implement that is handy to make the incision. Emergency cricothyroidotomies have been performed with scissors, hunting or pocketknives, razor blades, broken glass, and the jagged edges of a lid from a tin can. The airway has been held open with such objects as paper clips, nail clippers, the plastic barrel from a ballpoint pen, and a piece of plastic straw from a sports water bottle. A needle cricothyroidotomy must be replaced by a formal surgical tracheotomy or other means of ventilating the patient within 45 minutes. A surgical cricothyroidotomy can be left in place for about 24 hours, but should be replaced within that time period by a formal tracheotomy performed in a hospital operating room . Other aspects of aftercare depend on the cause of the airway blockage and the nature of the patient's injuries. The head and neck contain major blood vessels, a large portion of the central nervous system, the organs of sight, smell, hearing, and taste, and the central airway—all within a relatively small area. Injuries to the face and neck often require treatment by specialists in neurology, trauma surgery, otolaryngology, ophthalmology, and plastic surgery as well as by specialists in emergency medicine. Normal results for a needle cricothyroidotomy would be adequate ventilation of a patient with a blocked airway for a brief period of time of about 45 minutes. Normal results of a surgical cricothyroidotomy would be adequate ventilation in emergency circumstances of a patient with a blocked airway for a period of about 24 hours. In general, cricothyroiditomy has a very low mortality rate, even when performed outside a hospital. By contrast, the mortality rate for patients who lose airway patency is 33%. Overall, emergency cricothyroidotomy is considered an effective way to create an emergency surgical airway with low overall morbidity. Cricothyroidotomy is generally considered a procedure of last resort, to be performed when other ways of opening the patient's airway have failed or are unavailable. It is frequently done if endotracheal intubation has been attempted and failed, or if intubation cannot be performed due to the nature of the patient's injuries. Endotracheal intubation is a procedure in which a breathing tube is introduced directly into the trachea through the patient's mouth or nose with the help of a laryngoscope. It is most commonly done during general anesthesia, but can also be performed to help the patient breathe. One alternative to cricothyroidotomy is a technique known as transtracheal jet ventilation (TTJV). 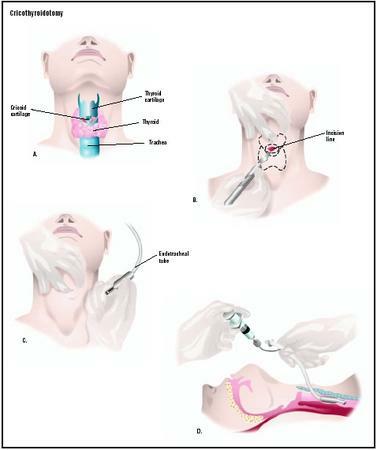 In TTJV, a syringe is used to introduce a catheter through the patient's cricothyroid membrane. The catheter is connected to a high-pressure oxygen supply. In hospital settings, TTJV has about the same rate of complications as a surgical cricothyroidotomy. Its disadvantages are that it cannot be used outside a hospital setting and it takes longer to perform. A surgical cricothyroidotomy can be performed in 30 seconds to two minutes; TTJV takes twice to three times as long to perform. See also Endotracheal intubation ; Tracheotomy . Gomella, Leonard G., and Alan T. Lefor. Surgery On Call, 3rd ed. New York: McGraw-Hill/Appleton & Lange, 2001. Adams, B. D., and W. L. Whitlock. "Bystander Cricothyroidotomy Performed with an Improvised Airway." Military Medicine, 167 (January 2002): 76–78. Bennett, John D. C. "Securing the Airway in Burns." Journal of Burns, 1 (2002): 1 [March 8, 23]. http://www.journalofburns.com . Flynn, Sean. "How to Save a Soldier." New York Times Magazine, March 16, 2003. http://www.nytimes.com/2003/03/16/magazine/16BATTLE.html . Francois, B., et al. "Complications of Tracheostomy Performed in the ICU: Subthyroid Tracheostomy vs Surgical Cricothyroidotomy." Chest, 123 (January 2003): 151–158. Gillespie, M. B., and D. W. Eisele. "Outcomes of Emergency Surgical Airway Procedures in a Hospital-wide Setting." Laryngoscope, 109 (November 1999): 1766–1769. Hayden, S. R., and E. A. Panacek. "Procedural Competency in Emergency Medicine: The Current Range of Resident Experience." Academic Emergency Medicine, 6 (July 1999): 728–735. Janson, Paul, and Richard Iseke. "Hymenoptera Stings." eMedicine, July 26, 2002 [March 9, 2003]. http://www.emedicine.com/med/topic1058.htm . Levy, David, and Robert Buckman. "Neck Trauma." eMedicine, June 21, 2001 [March 8, 2003]. http://www.emedicine.com/emerg/topic331.htm . Parsa, Tatiana, Arthur Adamo, and Yvette Calderon. "Initial Evaluation and Management of Maxillofacial Injuries." eMedicine, August 28, 2002 [March 8, 2003]. http://www.emedicine.com/med/topic3222.htm . Rehm, C. G., et al. "Cricothyroidotomy for Elective Airway Management in Critically Ill Trauma Patients with Technically Challenging Neck Anatomy." Critical Care, 6 (December 2002): 531–535. Torres, Manuel. "Case Study: Airway and Facial Trauma." Stat Page: Newsletter of the Center for Emergency Medicine, 8 (February 1997): 6–7. Vassiliu, P., et al. "Aerodigestive Injuries of the Neck." American Surgeon, 67 (January 2001): 75–79. National Association of Emergency Medical Technicians (NAEMT). P. O. Box 1400, Clinton, MS 39060-1400. (800) 34-NAEMT. http://www.naemt.org . University of Maryland Medical Center, R. Adams Cowley Shock Trauma Center. 22 South Greene Street, Baltimore, MD 21201. (410) 328-2757 or (800) 373-4111. http://www.umm.edu/shocktrauma . Jaberi, Mahmood, Kimberley Mitchell, and Colin Mackenzie. Cricothyroidotomy: Good, Bad, or Ugly? Third Place Scientific Award, 14th Trauma Anesthesia and Critical Care Symposium, San Diego, CA, May 17, 2001. Under ideal circumstances, a cricothyroidotomy would be performed in a hospital emergency room, ICU, or trauma center by a general surgeon, otolaryngologist, or anesthesiologist. Because it is an emergency procedure, however, a medical student, physician's assistant, paramedic, or nurse may also perform cricothyroidotomies. Many trauma centers require paramedics and nurses specializing in emergency medicine to practice performing cricothyroidotomies at least twice a year in a clinical laboratory in order to keep their skill level high. Since the procedure is risky but uncommon, it is important for emergency personnel to feel comfortable with the equipment and techniques required. Military personnel are trained to perform emergency cricothyroidotomies in combat situations. There are also cases reported of cricothyroidotomies being done in emergencies by civilian bystanders with some medical training. Am I likely to have lasting side effects from this emergency procedure? My son had gun shot wound under his chain straight up to his forehead. He was alive for 12 days. But I did not see any other surgery procedures done except the criconthyroidotomy which was done from Balad Iraq. They flew him to Lanhstul Germany Hospital,and his face was blown up like a balloon, his nose was plug with 2 feminine tampons with the strings hanging on his face. Old blood smelly from his wound and I had to remind the nurse on duty to please change the cotton on his forehead and neck that cover the wound. The surgeon that meet us in Germany brief us about the condition of my son that part of his brain was compressed. How can not be if there is no oxygen traveling to his brain. I asked them to transfer my son to Walter Reed Army Medical Center if he is stable to fly and have his treatment there. They flew us the next day and the surgeons at the hospital told me that his brain already compressed except the lower part that give him the reflex. My son died after 12 days of the accident. My son's vital organs are perfectly stable and my question is; Is there a chance that my son could have survive if they operate him as soon as possible? Your input is greatly appreciated. Those, most likely, were not femine tampons that were in your son's nose. They were specially designed sponges that have strings that look like tampons and maybe called tampons too. Either way, they are perfectly designed to apply pressure to stop bleeding in a small spaces. My brother had this due to reaction to medicine. The result was a double lung collapse and a 2 week stay to recover from the consequences. How often does this occur. He was static in we on guerny. Was the nurse incompetent or was he just really unlucky?